SEOUL is looking for people who can talk about love and dating in Korea for our February issue. 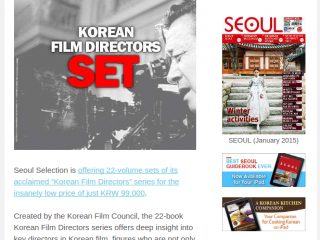 If you are interested, send an email to Claire at english@seoulselection.com. 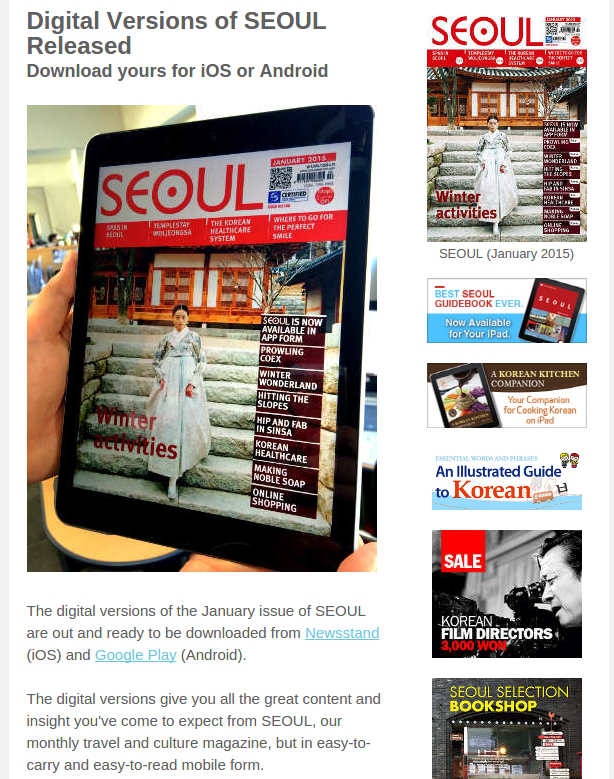 The digital versions of the January issue of SEOUL are out and ready to be downloaded from Newsstand (iOS) and Google Play (Android). The digital versions give you all the great content and insight you’ve come to expect from SEOUL, our monthly travel and culture magazine, but in easy-to-carry and easy-to-read mobile form. In this issue of SEOUL, we visit the newly reopened COEX Mall, go skiing in Ganghwado, meditate at historic Woljeongsa Temple and talk with two very philanthropic soap-makers. Korea has posted a record for cultural exports. In Korea, star teachers become millionaires. More problems between McDonald’s and the Korean-American community of Queens. Kim Sungjin captures the sights from Cheongdam Baesuji Park. Photographer Im Chang-kyung’s year in pictures. Sunrise over a frozen Gyehwado. The first sunrise over Busan’s Haeundae. Folk rock duo The Swell Season will hold a special performance for Korean fans. The Swell Season is a project duo formed by guitarist and songwriter Glen Handsard and Czech musician Marketa Irglova. The two artists starred together in the musical film âOnce,â playing the two main characters. Most of the songs from the film were composed by Glen Hansard, and âFalling Slowly,â the title song of the original soundtrack, won many awards including an Academy Award for Best Original Song. The concert will take place around the same time as the premier for the musical âOnce,â which is a musical stage adaptation of the film. The project duo disbanded in 2009 after their last album, but have reunited once gain to hold this special performance for their Korean fans. GETTING THERE: Gwanghwamun Station ê´íë¬¸ì­ (Line 5), Exit 8. Take advantage of the music performance show “Wedding”‘s special New Year’s sale. 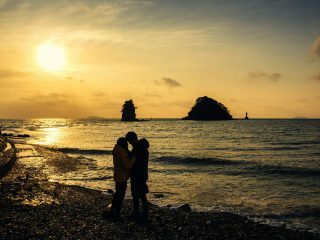 Head to the show’s homepage (www.musicshowwedding.co.kr) to make a reservation – just click on “New Year Special” to get a 20% discount. High Street Market Online Event! This year, healthy eating begins with healthy choices at High Street Market. All New online customer signups in January receive a KRW 3,000 Bonus Coupon! To order, visit www.highstreet.co.kr. David Nash is a Wales-based wood sculptor. He works with trees that have reached the end of their time and gives them a second life as art pieces. Instead of using the usual tools like chisels and abrasives, he uses a chainsaw, axe and blowtorch to bring out different textures. He finds natural cracks in the wood and tweaks them to create unique monumental pieces that complement their surroundings. His works can be divided into two kinds: installations in an outdoor natural environment, and pieces for indoor architectural environments. In 2004, he received the Order of the British Empire for his service to the arts. GETTING THERE: Anguk Station ìêµ­ì­ (Line 3), Exit 1. Exhibition âHome, Where the Heart Isâ was inspired by a quote from a Korean architect, Chung Gi-young. He had once said, âWe simultaneously live in three kinds of houses: a house of memories where we spent our childhood, a house that we live in right now, and the dream house that we hope to live in someday.â Architects, installation artists, and painters inspired by the quote have interpreted âhomeâ according to these three types. In the exhibition, artists explore the array of memories, emotions and concepts the word âhomeâ brings about. At âGallery 1: Home I lived,â visitors will experience art that recalls home in our memory. At âGallery 2: Home I live,â visitors will encounter statistics and the reality of âhomeâ today. At âGallery 3: Home I dream,â visitors will get to experience examples of alternative homes. GETTING THERE: Hyehwa Station ííì­ (Line 4), Exit 2. In January, the RASKB offers a series of indoor tours to escape the winter cold. The first of these is a trip to Kyung Hee University (KHU), a private comprehensive university renowned for its beautiful garden-like campus. However, it also has plenty of indoor attractions. The KHU Natural History Museum is one of the oldest such museums on the Korean Peninsula, first opening in 1978 to fulfill the university’s founding spirit of “creating a civilized world” through research in nature. Housing over 90,000 pieces, it includes displays of various wildlife found around the peninsula and abroad. First sunrise of 2015, seen from Seonyudo Park. Photographed by Robert Koehler.